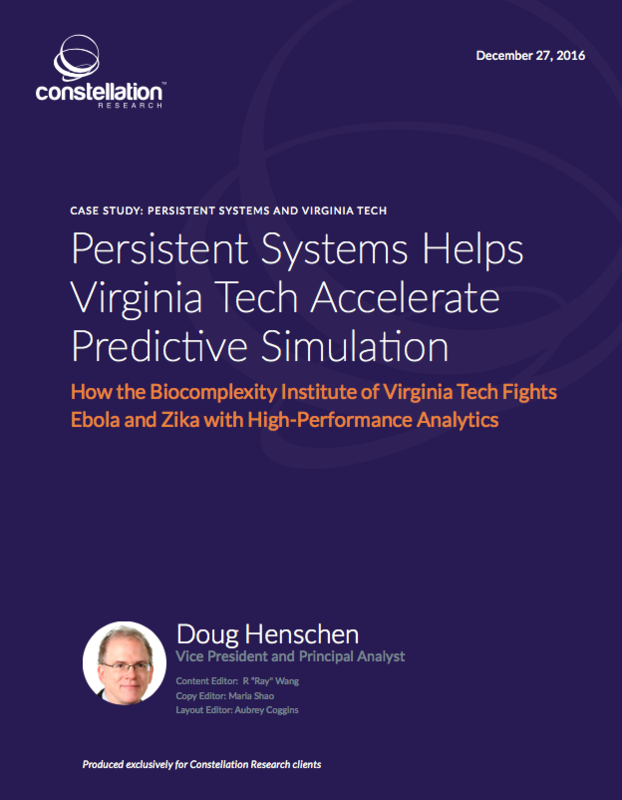 Persistent Systems Helps Virginia Tech Accelerate Predictive Simulation | Constellation Research Inc. The Biocomplexity Institute of Virginia Polytechnic Institute and State University (BI-VT) helps U.S. government agencies and non-governmental organizations to predict, prepare for, and prevent the spread of infectious diseases. With help from Persistent Systems (Persistent), BI-VT has dramatically increased the speed, scalability and accuracy of its analytical modeling and simulation environment while extending access to non-technical users. The results were so impressive – and so important to the health and security of the U.S. - that a panel of five judges unanimously awarded BI-VT Constellation’s 2016 SuperNova Award in the Data to Decisions category. The lessons learned and advantages gained can be applied to many advanced analytics and high-performance computing environments.